One of the problems of a recumbent is the super-super long chain, often twice or three times as long as a standard chain. It's heavy, it's hard to adjust, it's dirty. Are there any commercial recumbents** that ditch the chain for something else? ** I.e., not a youtube one-off experimental bike. The core problem is that chain drives are ridiculously efficient, and bike riders care a lot about power losses. Even a cheap derailleur setup can get efficiency over 95%, and the gap between 95% and 90% is noticeable to most riders. Note that the bike they're talking about there seems to have never made it into production - the web site is now dead. There's another "first shaft recumbent" from before that, also dead. Note that as with the all wheel drive trike when something unique breaks you have to make your own replacement parts if the manufacturer isn't around. That's not an issue for someone who's built their own bikes like Peter Eland, but for most riders it's going to mean living without that unique part. There is a front wheel drive bike with modified hub gear that is currently (Jan 2017) available for pre-order, the KerVelo, but that bike is also heavy and aimed more at comfort than speed. Given the long history of ideas like this not making it into production I am skeptical that this one will. A front wheel drive bike might be a better bet if you're really fussed by the long chain. Most faired speedbikes are FWD for the reasons you mention, but I suggest not trying to use that exact approach (the bikes are expensive and only work on straight roads with no wind). Those bikes exist, but generally are a small niche because they're tricky to ride. Flevobike and CruzBike are the two brands that spring to mind here. Cruzbike are still recovering from their start making awful conversion kits for uprights that never worked very well. Their from-scratch bikes might be better, I haven't ridden one. There is a dedicated community of FlevoBike enthusiasts out there. As always Atomic Zombie have their DIY take on that approach which might be a useful way to experiment with the idea. The moving bottom bracket design makes drive very simple, at the cost of making riding more interesting. Back pedal brakes made it more tricky to get started than I expected, but at least it had brakes. 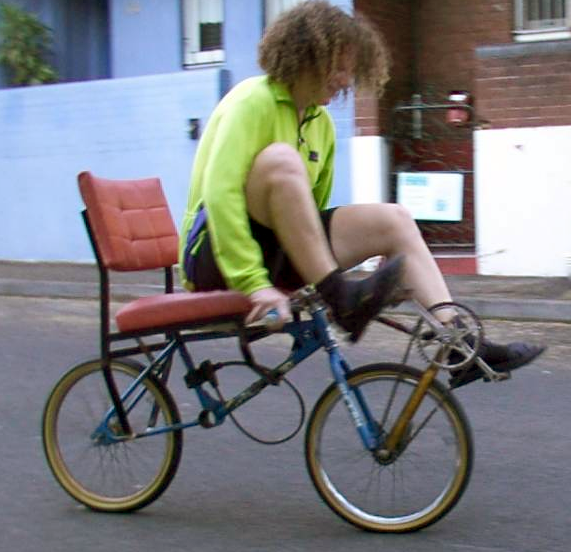 With proper gearing they can be quite rideable. Bicycles experience ridiculous torque at the bottom bracket. Mid-size car levels of torque (but at much lower rpm). That's why BB axles are such heavy, rigid parts. Extending that BB axle to become a shaft drive is tricky. With shaft drives there are two broad options: have a thin, light shaft spinning fast, or a heavier shaft transmitting more torque at lower speed. The thinner, lighter shaft means gearing up a lot at the cranks, then down at the back wheel, and precision bearings to keep friction down for that shaft. But that long, thin shaft is fragile. Making it a bigger, hollow shaft is hard because you really want it inside the frame, or underneath it, and either option is mechanically complex and every gearing step adds friction. It also needs to be completely enclosed because bearing seals would add too much friction. It can be done, but it's cheaper and easier to gear up less and have a stronger shaft spinning more slowly. Normally shafts are sealed but the enclosure means the shaft diameter has to be smaller than the enclosure, and since the total size is limited that means the higher torque option is required. I have ridden a 2WD MTB with a flex shaft drive, and there was significant shaft wind-up under load. That meant that front wheel drive really only kicked in once the rear wheel slipped a bit which was disconcerting. There was also noticeable power loss from the flex shaft. The bike seems to have disappeared, so apparently other people didn't like it either. Not the answer you're looking for? Browse other questions tagged recumbent shaft or ask your own question.